The Art House01924 312000work Art GalleryThe Art House provides time, space and support for artists, makers and creative businesses to develop their practice. It is a place where artists and audiences of all kinds are welcome to experience contemporary visual art and learn about the practice of being an artist through a year-round programme of exhibitions and events. Established in 1994 by a group of disabled and non-disabled artists, The Art House is both a visual arts development agency and registered charity whose facilities are fully accessible. Alongside a programme of training, mentoring, residencies and commissions, The Art House develops a range of projects designed to engage audiences in the artistic process and contribute to an essential discourse around diversity in contemporary visual arts practice. 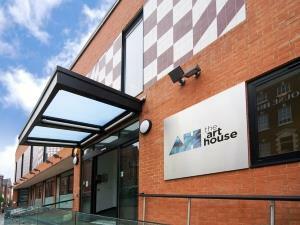 The Art House provides time, space and support for artists, makers and creative businesses to develop their practice. It is a place where artists and audiences of all kinds are welcome to experience contemporary visual art and learn about the practice of being an artist through a year-round programme of exhibitions and events. Open Monday - Saturday: 09:00 - 17:00. Late opening: Monday and Wednesday until 20:30. Everyone welcome.